Please use Contact Support button below and we will reply as soon as possible. Adding employees to the system gives them a unique login allowing them to create and collaborate on projects. 1.) From the top menu, select Settings>Employees. 2.) Click + Employee to add a new user to the system. 3.) Select whether this is a Full User or a Field User. 4.) Enter the employee’s: First Name, Last Name, Email, Phone Number, and Password. 5.) Choose a Calendar color for the user. 6.) 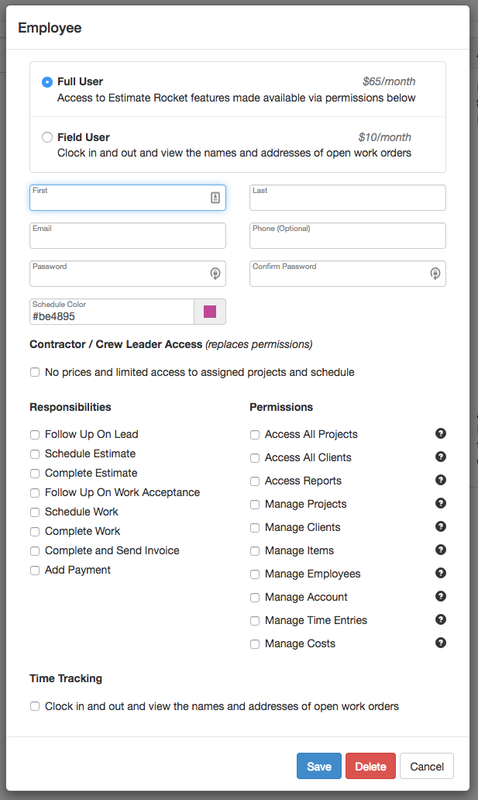 Choose whether this is a Contractor/Crew Leader user. 7.) Choose the Responsibilities and Permissions the user will have. 8.) Choose whether this user can clock in and out using Time Tracking. Determine which work states employees are allowed to be assigned to. For example: When an employee has the Schedule Estimate responsibility checked, they can be assigned to the Schedule an Estimate project step. Determine what the employee can view and have access to change. For example: If you want an employee to only see projects that are assigned to them, then you would un-check the Access All Projects and Access All Clients check boxes. Permissions beginning with Manage (Manage Projects, Manage Clients, etc) should only be granted to trusted employees.